What? It's January 21st, and this is my first post of the year? Yikes! It has been crazy here with a remodeling project we thought we had time for. I will be happy when it's done, but I am still not sure if we had time for this or not! I will bring you lots more details on that project a little later. In the mean time.... I had a recipe I made for Christmas that I wanted to share, but I misplaced my notes until they surfaced in a box yesterday. 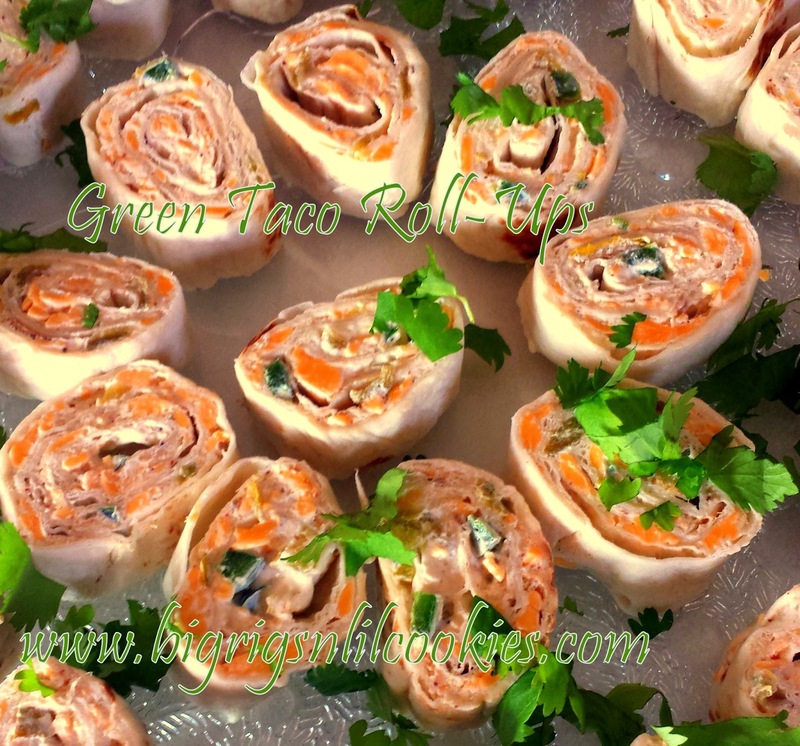 Green Taco Roll-Ups! Perfect appetizer for any football or Superbowl parties coming up! Make them the day before you need them, then the day of your party, all you have to do is slice, plate, and dig in! My family loved these. Nice flavor, without being too spicy. My husband and my mom ate them with no complaints, so you know they weren't too hot! Mix cream cheese and sour cream until well blended. Add peppers, cheese, spices, and taco sauce. Stir until thoroughly combined. Warm tortilla's in microwave for 10-15 seconds to make them easier to roll. Spread large spoonful of filling onto tortilla, spread evenly. Roll up tightly. Wrap in plastic wrap. Repeat. Refrigerate overnight. Before serving, slice with sharp knife between 1/4 to 1/2 inch thick. Garnish with cilantro if desired. I need these roll-ups for my lunch! They are delicious and healthy as well! Welcome back :) we've missed you! But, you made it up to us with this yummy recipe! I can't wait to try it. Looks great for SuperBowl! I have enjoyed looking at the IG photos of the remodel. It looks beautiful. this is pretty much a perfect super bowl food! easy to eat and make, not too messy, and YUMMY! Oh I love this idea, and it is meatless! Pinned it for future use, followed you here from Foodie Fridays. These look great! We may have to make it for the Super Bowl!